I hope you all had a good week! The last ten days were really exciting for us. We started the blog, met new people and developed several projects. Now we're looking forward to enjoying a weekend with good friends, good books and good food. After a long work day it is not always easy to decide on what to eat. That's why we came up with the idea to share with you our favorite recipes every Friday. We hope that our weekend recipe will inspire you to try new dishes and love them the way we do. Enjoy! What is the best way to celebrate the weekend after a long, cold and grey week in February? Right, a delicious salad that tastes like spring and reminds you that sometime soon there will be more than 0.001 minutes of sunshine per day. We granted ourselves with this yummy salad after a day full of realizing diy projects and planning the next steps for the blog. Try our version of a good and easy pinterest (what else?) recipe! 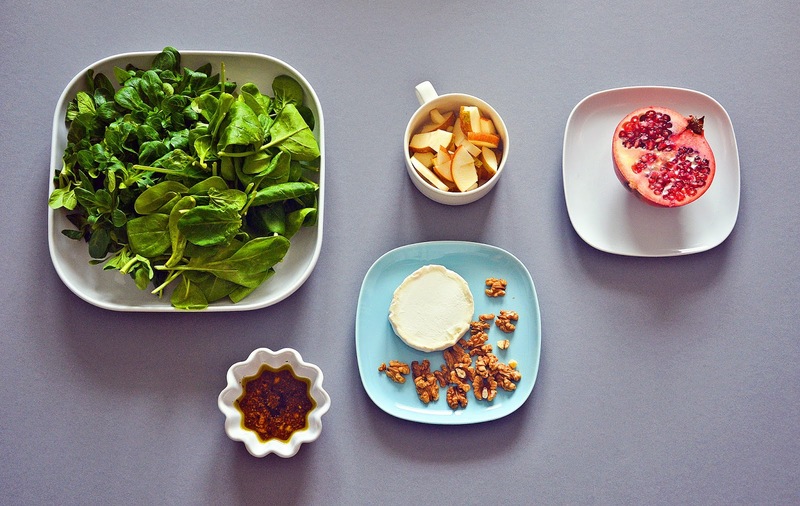 Put fresh spinach, field salad, pear, pomegranate seeds and walnuts in your salad bowl. For the dressing mix olive oil, balsamic vinegar, mustard, salt and pepper. 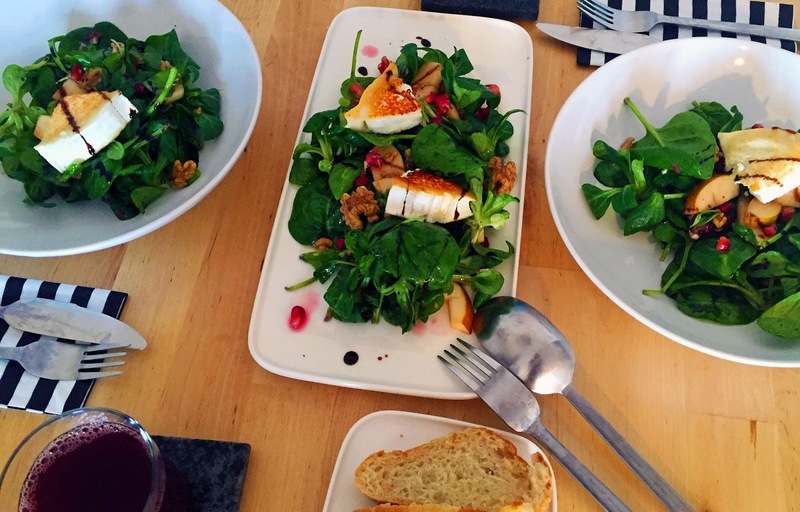 We quatered our piece of goat cheese and roasted it gently in a pan without using any oil. Pour the dressing over the salad, place the goat cheese on top and start to eat right away. The combination of fresh salads, sweet pear, crunchy walnuts and slightly sour pomegranate stones together with the still warm cheese tastes heavenly. p.s. : are you excited about next week's recipe? you better be...have a good weekend!